Suggested Use: 1 capsule every 8 hours, or as directed by a health care professional. PrimAGE is to aging as breakfast is to fasting. While pyridoxamine, like all B vitamins, is involved in the conversion of food into energy, its most exciting property was only discovered in the 1990s: pyridoxamine inhibits the formation of ‘Advanced Glycation End-products’ (AGEs). AGEs are damaged proteins that accumulate in the body as one ages, causing tissues to lose their elasticity and causing enzymes to malfunction. In fact, this accumulation of AGEs is considered to be one of the principal causes of aging. AGEs also play a major role in diabetes — they may account for much of the tissue damage that is seen in the diabetic state — including damage to kidneys (nephropathy), nerves (neuropathy), vasculature (atherosclerosis), and eyes (retinopathy, cataracts). helping to extract energy from food. PrimAGE is a formulation containing two forms of vitamin B-6: pyridoxamine and pyridoxal-5'-phosphate (P5P). (Ordinary vitamin B-6 supplements usually consist of another form, called ‘pyridoxine’.) The P5P in our formula slows the body’s conversion of pyridoxamine to other substances, thereby prolonging its activity. Accordingly, we will limit our discussion of PrimAGE to a brief summary of recent pyridoxamine research, and let you draw your own conclusions about what medical conditions it may be effective in treating. 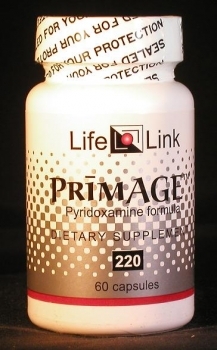 Therefore, pyridoxamine is likely to suppress some aspects of aging. Only a decades-long clinical study can demonstrate this conclusion beyond a shadow of a doubt, but few would be so foolish as to wait decades for such a study to be completed before going ahead and using pyridoxamine as an anti-aging supplement. Are pyridoxamine supplements effective for preventing diabetic complications? We aren’t allowed to tell you, so you should take a look at some of the references cited here, and then decide for yourself.